It’s only July, but the quarterback battle is already heating up in Happy Valley. At last week’s Lift For Life, Matt McGloin was made available to the media and laid claim to the starting job. In today’s edition of Morelli OnLion, we’ll re-visit the QB battle. 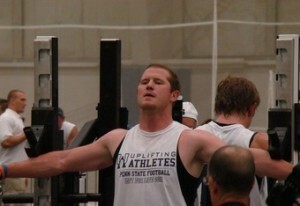 At last Friday’s Lift for Life, Matt McGloin talked with the media about the upcoming 2011 Nittany Lion season. He talks like a player who expects to be the starter when the season begins on Sept. 3. In this same spot last week, we proclaimed McGloin the starter until someone unseats him. That someone would likely be either sophomore Rob Bolden or freshman Paul Jones. Neither of those players were made available to the media at LFL. According to several sources, Bolden did not take part in LFL due to a coach’s decision. However, it appears that Bolden – after trying to transfer during the offseason – is back at Penn State for good. According to McGloin, Bolden is back and competing well. But one has to wonder why Bolden wasn’t made available at LFL. Did the coaches feel that he’s just not ready to talk with the media? Or perhaps he’s still warming to the idea of having to remain at University Park. We won’t know for sure until media day in August. Penn State QB Matt McGloin took part in Friday's Lift For Lift and spoke with the media about the 2011 season. Bolden started eight games and McGloin started five. However, McGloin played the entire Outback Bowl and nearly led the Lions to an upset over the favored Florida Gators despite throwing five interceptions, his worst performance of the year. As the Lions ready for the 2011 campaign, McGloin said that he is focusing on his decision-making in and out of the pocket. Whoever the QB is, he will have to be a leader. With guys like Evan Royster and Stefen Wisniewski gone to the NFL, McGloin or Bolden will have to step up and be a leader. Key departures make the QB even more significant. “The difference is the quarterbacks have to run it now. Last year, we had guys like (Brett) Brackett and Derek (Moye) run things, but now the quarterbacks have really stepped up and taken charge,” McGloin noted. The success of the 2011 Nittany Lions will come down to leadership, especially at the QB position. It’s not only about talent, but about heart and maturity. We already know McGloin has the talent and heart. His maturity was on display for all at LFL. He talked about the growing pains he endured last season. And so the competition begins. Former Penn State soccer star Ali Krieger’s shootout goal on Sunday against Brazil propelled the United States into the semifinals of the FIFA Women’s World Cup. On Wednesday, the USA knocked off France in the semifinals, 3-1, to advance to the finals. Krieger was a star at Penn State, but will probably be remembered most for her goal on Sunday. After the USA scored extremely late to knot the game at 2-2, the shootout began. In the shootout, consecutive made penalties by Shannon Boxx, Carli Lloyd and Wambach, U.S. goalkeeper Hope Solo made an important save on Brazil’s Daiane to give the U.S. a 3-2 lead after three kicks. Megan Rapinoe converted the next shot for a 4-2 lead before Francielle brought Brazil within one, setting up the kick by Krieger, which was successfully slotted into the lower left corner to cap the comeback. Morelli OnLion’s Final Thought: I watched Wednesday’s World Cup game at a sports bar near Philadelphia (not my first choice), but I have to say that I was pleasantly surprised by the afternoon crowd there to watch the match. It is games like these that should propel soccer into the national spotlight. If you didn’t watch the game or simply don’t care, then you’re not a sports fan. It amazes me that people will watch golf or NASCAR, but won’t give soccer a second look. Watch the final on Sunday. You won’t regret it. Chris Morelli is an award-winning writer/editor who lives in Centre County and covers Penn State athletics for gantdaily.com. He’s also a regular on “Sports Central,” which airs on ESPN Radio in Altoona and State College. E-mail him at morellionlion@gmail.com. Also, be sure to check out Morelli OnLion on Facebook!